You are here: Home > LG G2 dropped to $499, some upgrade customers seeing it at $403? LG G2 dropped to $499, some upgrade customers seeing it at $403? This might just be one of the bargains of the century so far for T-Mobile users. 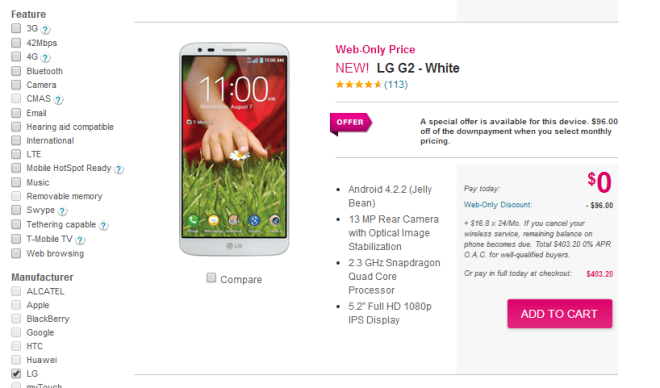 If you head on over to the LG G2 product page, you’ll spot the price has dropped from $600 to $499.20. On EIP, that’s $0 down and 24 monthly payments of $20.80. So, that’s a high-end “phablet” for the same price as a “regular” smartphone. But that’s not all, one of our readers has been keeping a keen eye on the G2, waiting in hope that the price drops before upgrading. When he spotted that the handset had been discounted by $100, he started the upgrade process, and was surprised to see that upon arriving at the page of available handsets, the G2 had been discounted even further. It looks like – for certain customers – there’s a web-only discount of $96. That takes the cost down to just $403, or 24 monthly payments of $16.80. I must repeat: This seems like it’s only for upgrading customers, and it’s web-only. Don’t go asking for this in stores. If you’re due an upgrade, and want to check it out, let us know if the same price shows up for you. ← Legere okay with Sprint/T-Mobile merger as long as he’s in charge? If it wasn’t for those darn buttons, lack of removable SD card and battery then I would be all over this phone. To get rid of the bloat,did u rooted? Who needs a removable battery when the battery life is so amazing? My old Galaxy s2 would spend half my day at work plugged into my computer and I would still have only about 30% battery at the end of the day and this was with Juice Defender and doing everything I could to save the battery. With my G2 I have everything running and still have over 70% left on my battery at bedtime. I’m using the G Pro on T-Mobile to. Yes LTE works and is stupid fast. Keep in mind this phone works best in 1900mhz refarmed areas. I’m another that bought the ATT Optimus G Pro and then unlocked and moved it to my Tmo account. I did it only a couple of weeks after ATT started offering the G Pro. You should have seen the ATT rep’s face when I told her I wanted to buy the phone. She asked which plan and I told her “None, I just want the phone”. It was funny. Yes, LTE works just fine. Here in OKC I got 40.5Mbps down and 10.4 up using Speedtest to Houston. The G Pro has/had EVERYTHING I wanted in a phone. And the battery life is unbelievable. G Pro is the best phone I’ve ever owned. In May, I’ll have owned it for a year. Its too bad this wasn’t more well known because I would have tried it. Hmmm..400 would be very nice but if you get the 499 price, might be worth it to go with the Z1s. better specc’ed camera, microSD and waterproof. You’ll lose out on the screen size and quality but I think the other features are worth it. Meh, just go to swappa and get the same price for practically new devices. You could find a deal on swappa but lot of people are more comfortable with big store purchases that come with full warranty. Swappa is ranging from 400-420 for used G2’s with unsure warranty statuses or less than 1 year of the mfg warranty. Also getting from T-mobile would allow those who don’t want to front up 400 to pay in installments w/o any interest. I’m eligible for an upgrade and it’s showing at $403 for me as well. That’s a great deal. And honestly it isn’t a “phablet”, 5 inch is the new standard, look at the GS4. LG has a real phablet, the Flex. Well, this worked out excellent for me as I was looking to upgrade to a new phone today. Galaxy S5 $0 down please! With flexible pull out display? And complete wrap around screen. How is this for someone moving to an android device ( mom ) for the first time coming from a flip phone. This is a high end device that is very highly reviewed and very snappy. If you can get it for $403 then I would go for it but if not you would be better off buying a Nexus 5 or Moto X, Android phones can be a hassle sometimes and google brand phones work a bit better due to the native operating system. Id think a Windows Device would be easier for a first time smartphone user. Android (especially high end) is intimidating to many new Smartphone users. Deal not showing up for me anymore. I had it in my cart too at $403! :( But was too slow to pull the trigger. loged in in my account and the phone was 403 .then before buy it decided to see if i can root it on xda. when i return to website at 3:30 pt the offer was gone. bad luck i guess. I paid $603 for the phone 2 months ago, it’s a very good phone. I would say better than the SG4. I agree. Battery life is best I’ve seen yet. I sense LG is determined to play hardball with Sammy, HTC and Sony. I see the G3 coming out earlier than expected…just around the time the M8 and GS5 come out or a month or two removed. Such robust competition is good for us all. If they all come out around the same time…it makes for a better choice comparison b4 taking the plunge. Rom is supposed to mean ‘read only memory’ which is not writable. The term is incorrect.